The collegiate minimum standards are the Fraternity’s benchmark to understand a chapter’s operational prowess. The Heritage Center utilizes the Pulse Point process to oversee chapters and work with them to ensure they are continuously moving forward, increasing the efficiency of the executive board, and improving the experience for the general collegiate member. The process begins at the close of the academic year in June. Chapter Educational Resource Coordinators communicate with chapters and Regional Management Teams throughout the summer to solidify statuses and action items that will take effect for the upcoming academic year. Chapters then become responsible for completing assigned action items with the ability to be rewarded for their proactiveness. These are the minimum expectations set forth by the board of directors to remain in good standing. This is to ensure the chapter has the basic operations necessary for sustainability. At least four officers must attend Officer Training held in conjunction with PBLI. It is a constitutional requirement that each collegiate chapter shall hold at least two initiations each academic year. Mirrored after the four levels of Show Cause, collegiate chapters can fall into one of four levels on Pulse Point. Placement on any level is standardized by the number of minimum standard(s) missed and the chapter’s previous Show Cause history. Under the new levels, there are standardized outcomes that will have actions items specific to the minimum standard missed and the needs of the collegiate chapter. Feedback from chapters indicated their voice is not always acknowledged or what they know about their chapter is not considered. Through offering the chapters an opportunity to be a part of the conversation, students are encouraged to take ownership of the chapter’s improvement path, and increase productive conversations between the chapter, Heritage Center staff, and RMTs. What happens when my chapter receives our tentative Pulse Point Status and why should we respond? Chapters will receive communication of their tentative Pulse Point status from their CERC. The chapter will have an opportunity to accept the proposed status and missed standards or appeal them. Chapters being considered for Encouragement or Consultation are recommend to respond to their proposed status. Chapters being considered for Coaching and Rebuild must respond to the proposed status. Chapters will respond by filling out the Pulse Point Response Card, a fillable PDF, available at the bottom of this webpage. Failure on the chapter’s behalf to upload a Pulse Point Response Card by July 15th will result in confirmation of the tentative status and action items will be determined by the CERC with feedback from members of the chapter’s RMT. What happens after my chapter receives final Pule Point status and action items from the CERC? Taking into consideration any responses received, the CERC will finalize the chapter’s Pulse Point level and action items. Communication of this information will be sent to all the core seven officers listed in ChapterSpot and their CA via e-mail. How will my chapter know if our Pulse Point status has been re-evaluated? All chapters will receive communication on February 1st. This communication will detail if their status will remain the same, has been reduced, or if they have been removed from Pulse Point for the remainder of the academic year. Regardless of whether a chapters status does or does not change the chapter is still required to complete the full number of RMT check-ins they were assigned with their initial Pulse Point status. Who should I contact about my chapter's Pulse Point status? Contact your CERC or Regional Management Team regarding your Pulse Point Status. What is an RMT check-in? Regardless of the Pulse Point status, a chapter is awarded it will be required to complete a number of check-ins with a member of its RMT. Check-ins should be specific conversations around the completion of action items and how the chapter is progressing in meeting the minimum standards for the current academic year. The number of assigned check-ins should be broken up between the terms the chapter operates. Conversations should occur with the RMT member listed in your official Pulse Point status e-mail. If a chapter has its Pulse Point status lowered or removed it will still be obligated to complete the remaining RMT check-ins from their initial Pulse Point status. How does Probation relate to Pulse Point? Often chapters that are on Judiciary Committee probation find themselves missing minimum standards while trying to fulfill the probation terms. Chapters on probation prior to being placed on the Pulse Point report will have the terms of the probation status accounted for when determining the action items for the Pulse Point status. Chapters placed on Encouragement or Consultation that have probation terms related to one of the minimum standards missed will not receive action items related to that missed minimum standard. Chapters placed on Coaching or Rebuild status will only receive one action item related to the missed minimum standard. Chapters on probation for reasons unrelated to the minimum standard(s) missed will be assigned the standard number of action items its Pulse Point status dictates. What is a mid-year reevaluation? To encourage chapters to be pro-active in accomplishing the action items, a mid-year reevaluation of the Pulse Point status will occur. Chapters that complete 100% of the required action items (or recommended action items for Encouragement chapters) will have their Pulse Point status removed. Chapters that complete between 50% and 99% of action items will have their status reduced by one level. Chapters that complete less than 50% of the action items will retain the initial Pulse Point status for the remainder of the academic year. There is not an option to increase in level. That can only be done by re-assessing missed minimum standards at the end of the academic year. How will the mid-year Pulse Point Report Card be used? 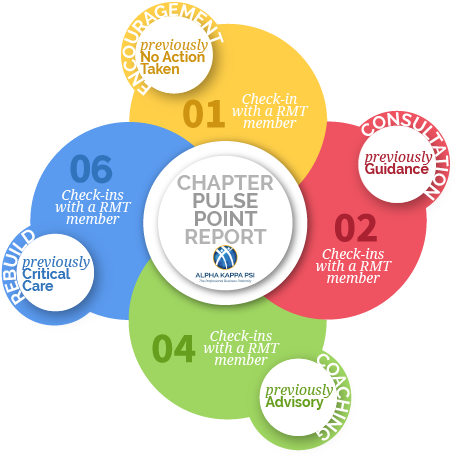 Chapters will complete a fillable PDF report card that must be uploaded into the Pulse Point subfolder in the current academic year folder in HQDocs within ChapterSpot. Information covered in the report card will include dates of completion for check-ins and action items as well as a summary of those conversations and how the action item was accomplished. In progress and outstanding action items will also be filled in in succession with how the chapter plans to accomplish the items prior to the conclusion of the academic year. What is the Pulse Point Report Card? To determine which chapters are eligible to have their Pulse Point status removed or reduced CERCs will review the report cards the chapters complete. Each Pulse Point status will have its own report card, an editable PDF, that will be available within the General Resources subfolder in the current academic year folder in HQDocs within ChapterSpot. Chapters will be responsible for filling out the report card as they progress through the academic term and upload no later than December 1st. The first section of the report card will allow the chapter to fill in the date of each of the RMT check-ins, who the check-ins occurred with, and a synopsis of the conversations. The second section of the report card will have drop-down menus that allow the chapter to select its specific action items. Once the action item is selected, it can list the status of the item (complete, in progress, or not started), input a date of completion/anticipated date of completion, name of the officer most responsible for the action item, and write up a summary of how it was completed or how it will be completed. The last section will be a mirror of section two to report back on the recommended action items. Report cards will only contain the sections necessary for the level, therefore Encouragement will not contain a section two and the Consultation and Rebuild report cards will not contain a section three. After an initial review, CERCs will reach out for any clarification required to determine if a chapter completed an action item that may tip the scale to have its Pulse Point level decreased or removed. Final status notifications will be distributed to the core seven officers and the CA on February 1. Where can I find my Pulse Point Report Card? The Pulse Point Report Card that matches the chapters finalized Pulse Point status will be available within the Pulse Point subfolder in the current academic year folder in HQDocs within ChapterSpot. How can my chapter be removed from Pulse Point? Chapters that complete 100% of their required and/or recommended action items will have its Pulse Point status removed. This would reward chapters for being pro-active in accomplishing the action items. How can my chapter's Pulse Point status be downgraded? Any chapter that completes 50% or more of the action items could have its Pulse Point status decreased to the level immediately below its current standing. This would acknowledge the hard work put into completing the action items while encouraging the chapter to complete its remaining outstanding items. What is Level Status Quo? Chapters that complete less than 50% of the action items, or that have not uploaded a report card by the December 1st deadline, would retain the Pulse Point status received on August 15th. An additional check in with the CERC will be added as a requirement to discuss what is holding the chapter back from accomplishing action items. Use these operational resources to help you and your chapter.